This is a listing of current positions available within the company. Check back as we are growing and all listings are subject to change. At Willis Mechanical, we understand that our success depends on the success of our customers and our employees. Building our team with strong performers is the most important thing we can do to ensure success. Willis Mechanical was founded in 2002. We made it through the recession, and continue to grow today. Where will you be in 5 years? The opportunity for advancement is substantial at Willis Mechanical. Willis Mechanical believes that training our team is important. We consistently spend time and money training our team so they can remain relevant in their fields. Due to our recent growth we are seeking a team member with Mechanical Construction Project Management experience to work within a team environment to provide truly exceptional client service.  Estimate and sell plan/spec projects and design-build projects.  Ability to work within an environment with deadlines while having to multi-task with multiple priorities. We are looking for an amazing, data-driven inbound marketer to own the majority of the marketing funnel for our company. You will be in charge of website design, attracting site traffic, converting that traffic into new leads for the business, and nurturing those leads to close into customers, the latter of which sales leadership will help you accomplish. As we grow, so does our need for dispatching. We are seeking part-time professionals to assist with dispatching technicians, invoicing clients, and working on other assorted administrative tasks in the service department. This individual must have outstanding customer service skills, communicate exceptionally through telephone and type, and be inspired to take care of our customers. 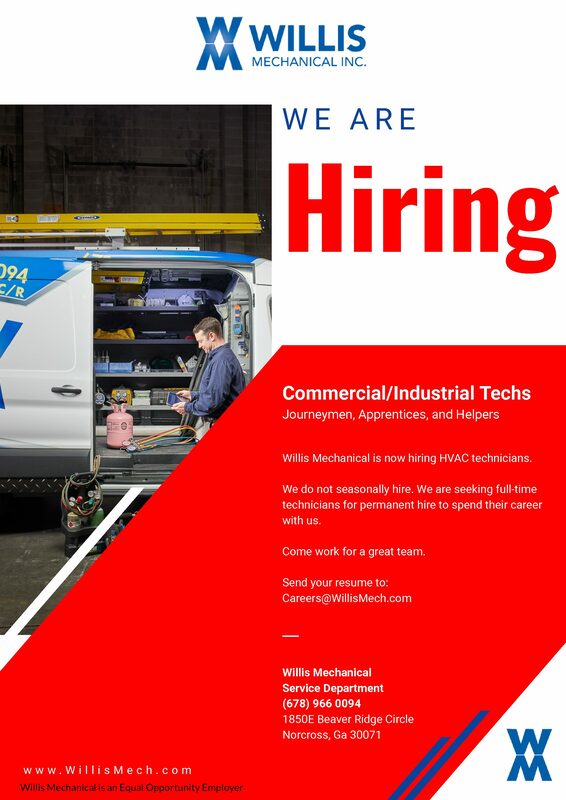 Willis Mechanical is searching for Outside Sales representatives to discover, define, and win new business. Resumes accepted immediately. The successful salesperson will source new sales opportunities and close sales to achieve quotas. The successful candidate will play a key role in increasing income and revenue by managing and negotiating with clients, generating leads, qualifying prospects and managing sales of products and services. As an outside sales representative, or sales agent, they will also research sales competition. · Understanding our company culture of hard work, even in adverse conditions. · Experience working with CRM software. At Willis Mechanical, we understand that our success depends on the success of our customers and our employees. For our customers, we deliver the highest quality materials and craftsmanship available. For our employees, we foster a culture of success where employees are treated as family, and encouraged to succeed. · Company provided computer, iPhone, and other devices. · Base pay plus commission program. Inside Salespeople enter the picture once the initial purchase is complete. Unlike an outside salesperson, whose accounts are constantly changing, an Inside Salespeople’s portfolio is relatively stable. You’ll work with each customer to understand their needs, create a long-term strategy, and help them realize the greatest possible ROI from our products and services. An Inside Salespeople also serves as the client’s primary point-of-contact at the company for non-service call communications. If it’s not a service call, they’ll go to you. The main metrics you’ll be measured by? Retention and satisfaction rates. But Inside Salespeople also look for up-sell and cross-sell opportunities. For some deals (usually smaller ones), they’ll handle this conversation with the customer directly. For larger deals, it’s more common for a salesperson to take over once an opportunity to expand the account comes up. Successful Inside Salespeople are also skilled at balancing multiple needs. For any given account, you must consider the client’s objectives, our company’s objectives, sales targets, and more. Lastly, you’ll need to speak your customer’s language. Whether that is technical terms about HVAC or layman’s terms- you need to be able to speak it.